I found it hard to get to sleep last night, despite having cycled 90 miles, as I was excited at the prospect of reaching Astoria – my final destination. 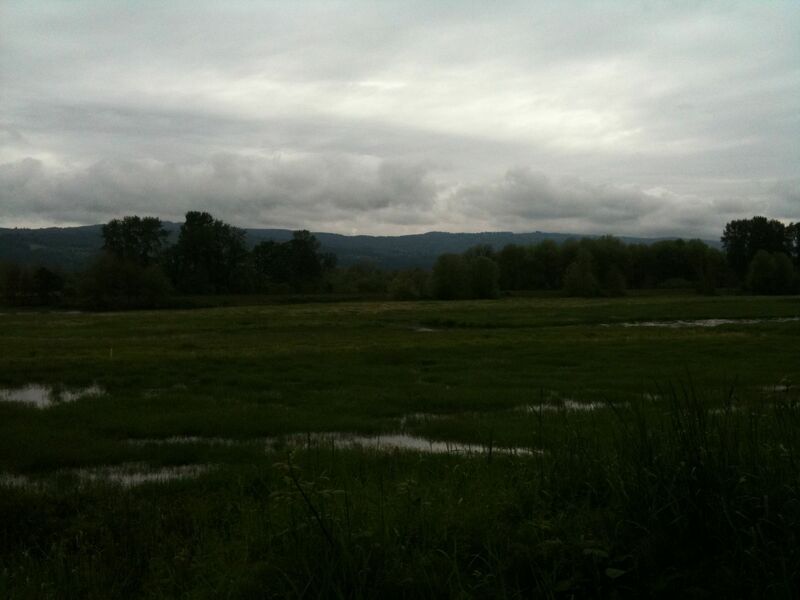 I had a choice of two routes to the coast – I had decided to tale the more direct route that would take me via a beach on the way to Astoria. However, I asked the receptionist at last nights hotel, and she told me that there were some pretty bad roadworks going that way, so I decided to take the longer route that reached the coast at Astoria. I was up and on the road by 06.00, the first 10 miles were slow and difficult as I had to navigate through Metropolitan Portland. Even that early in the morning it was congested, and traffic lights meant that I was stopping every 2 minutes. Soon enough I was out of the city and onto Route 30 – the traffic gradually decreased and I was soon out into the countryside. There wasn’t much of a view for a lot of the ride, as I was cycling through the Clatsop State Forrest, and so dense pine trees lined the road te majority of the time. 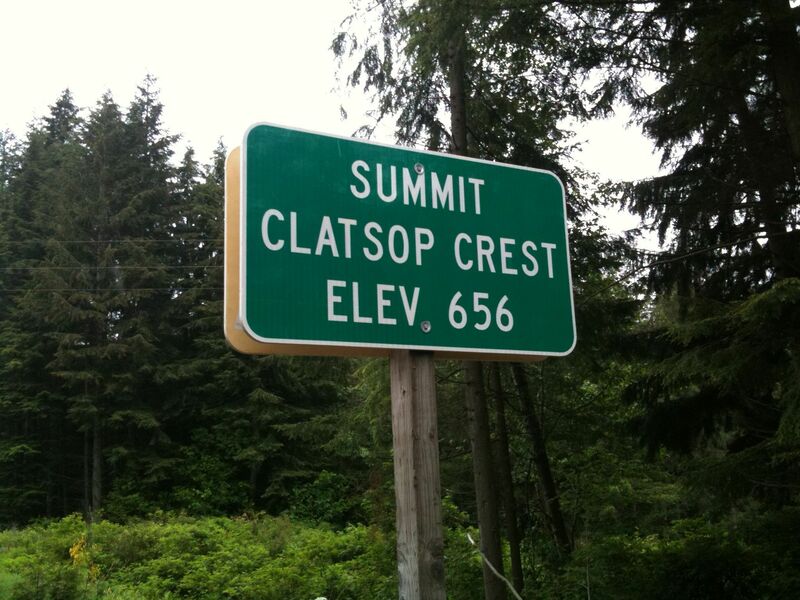 I had to cross the Coastal Range to get to the sea, and so had a couple of big climbs today. Although they were long and steep, the trees thinned near the top, giving me some great views out over the Columbia River. I made really good time this morning, and when I started picking up signs to Astoria, it gave me a real boost – the culmination of months of preparation, and weeks of hard work was in sight. About 30 miles out of Astoria it started to rain: lightly a first but building into a torrential downpour, until I was saturated. I peddled faster and faster as I got closer, flying up the hills and not caring in the slightest about the rain. 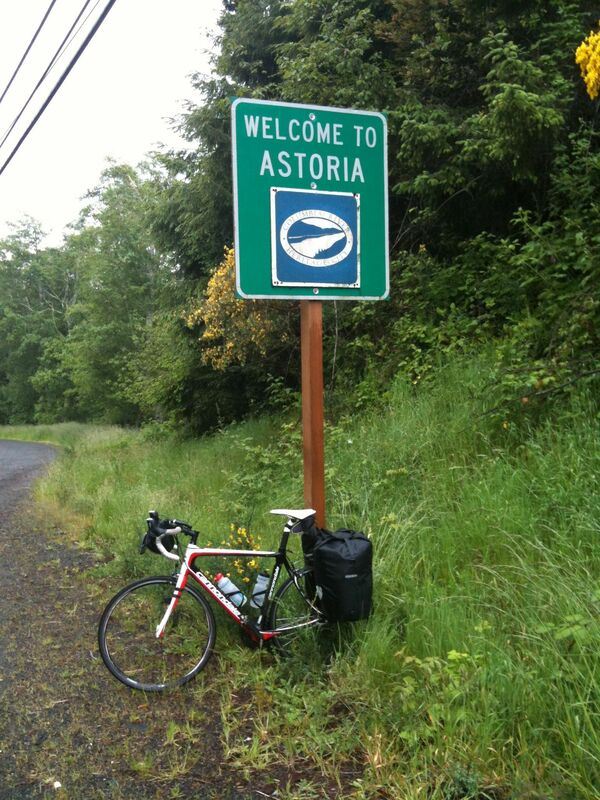 I reached the ‘Welcome to Astoria’ sign and stopped to get the obligatory photo, with passing cars and RVs giving me odd looks – I must have looked slightly demented, standing in the rain taking a photo of a bike and a road sign! 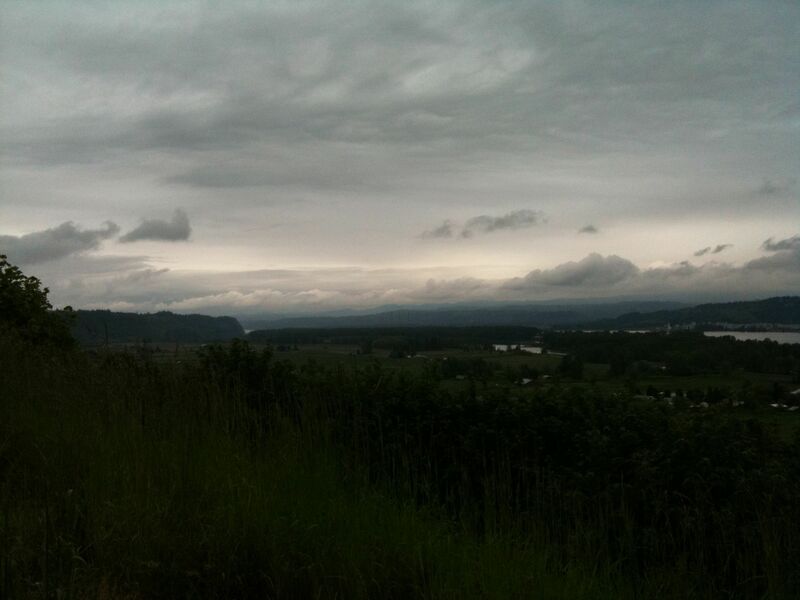 I had a short climb up to the top of a hill to see the Pacific from the point where Lewis and Clark first saw it. 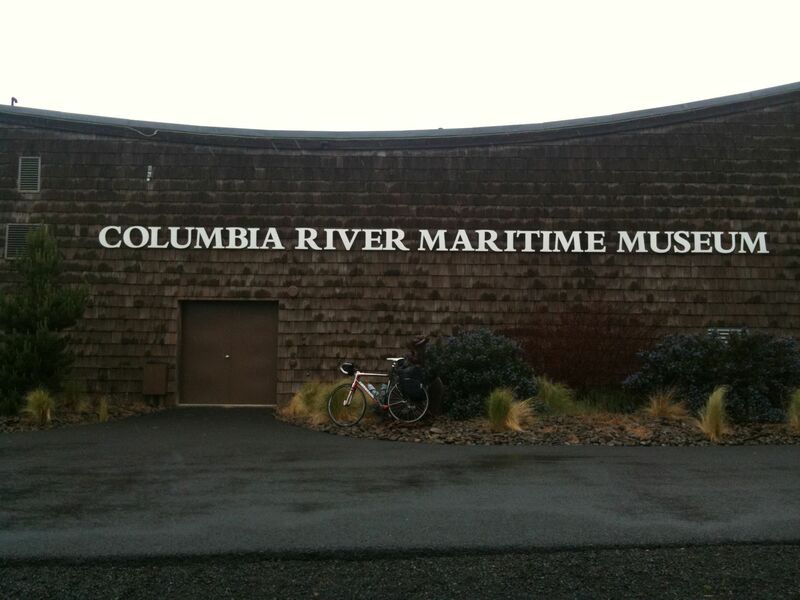 It was awesome to see the sea, having left the Atlantic 54 days ago, but the rain made I hard to see much so I coasted into town, and was soon standing outside the Columbia River Maritime Museum – the official end of the Transamerica Trail. The moment was, in a word anticlimactic. Throught the trip, it had been my goal to reach that spot, but when I got there it was just a building, on a street in the middle of an American city – no fanfare, or cheering crowds. I realized then that it was the journey that counts, not the destination. This trip has given me memories to last a lifetime and standing there in the rain, the fact that it had all come to an end didn’t seem to sink in. I dragged a guy out from the museum, and got him to take my photo – it didn’t come out too well, as the rain was truly torrential by this point. From there I went to the bike shop – about 14 miles out, I felt my rear wheel go out of true and wanted them to get it sorted so I could cycle down the coast to a beach tomorrow. However, the wheel was totay written off – one of the spokes had pulled through the rim. According to the guy at the shop I was lucky it didn’t collapse on the way into town, talk about divine providence – my bike just lasted the distance. So the shop are now going to pack up my bike for the return trip. Tomorrow I’m going to get a bus down the coast 16 miles to a beach, so I can finally get a proper look at the ocean. 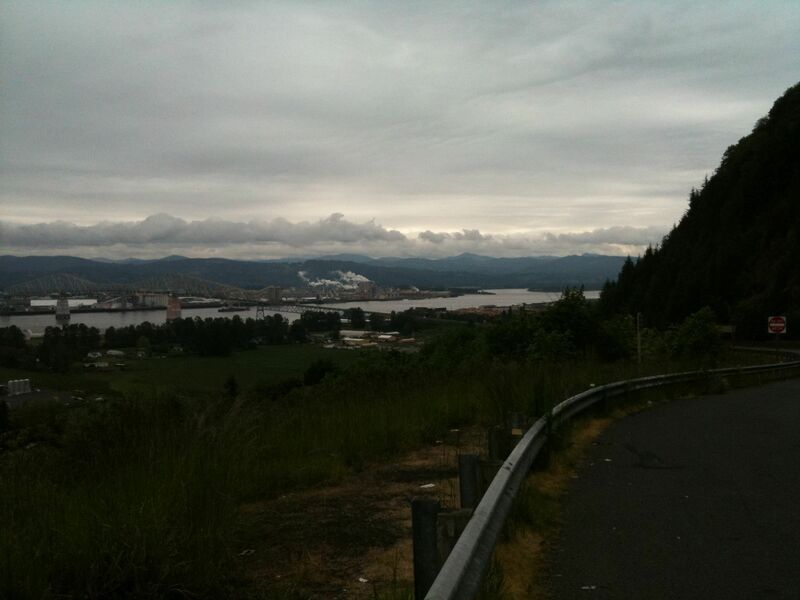 Astoria is on the coast, but it’s a port at the mouth of the Columbia, so there’s no real access to the sea. Well done, Ed!!! What a fantastic achievement – sorry to hear the end was a bit of an anti-climax, but think of all the memories you will have of your epic trip. You have raised a wonderful amount of money for the SBSA which will go to help those in need in the future. What a tremendous legacy to the memory of your dear Dad. Enjoy your trip to the beach and have a safe journey home to dear old Blighty!! What a wonderful, wonderful achievement! Well done my darling…I am so very proud of you. It might have been an anticlimax standing outside the Columbia Maritime Museum, but as you say the trip was never about the finish. This journey has given us a glimpse of your strength and resolve and has demonstrated what an extraordinary young man you are. As Caroline said there could be no greater testimony to Dad’s indomitable spirit, than to see it being carried forward by you. In a word. ‘Fantastic’. I have really enjoyed following your story. Thank you very much. What a wonderful achievement a life long memory. You have been fantastic and have taken it all in your stride whatever you have come across you have persevered you should be so proud of yourself and what you have achieved. Flags out for Ed and England. Have a good trip to the beach and a safe return and looking forward to seeing you again. a huge tribute and done us all proud,but more than anything you have done yourself proud,you are a very special person and we all admire and love you so. Well done Ed Love you GMa GPa. Well done Ed, sorry I could manage to get out to join you as I had hoped but I have been following your journey daily. I must say it is a fantastic achievement and one that your father is proud of I’m sure!! I hope to meet with you at some point and shake your hand in person. Congratulations mate. just an amazing journey you have achieved, and although it might have felt an anticlimax that is only expected as no emotions at the end could match the amount you’ve felt through out the trip, its more a testament to how much of your self you’ve put into the trip…just an inspirational journey. it seems a long old time ago we all sat down around the kitchen table, mum calming she could do the cycle as long as she had the right mental attitude, as time passed, and you cycled deeper into the heart of America, she let out squeaks admission that perhaps she wouldn’t be able to complete it on sheer mental determination, and yesterday, she turned to me and said, ‘you know, I’m now shore I could complete an expedition like this, yea, as long as my support van meet me each night’, aahaha, that really made me laugh. This trip not only needed the mental strength that you so defiantly have, but also is a huge physical journey that not many people at all could achieve. Well done mate, now just bask in to completion of such a trip, in till you get the plane home and celebrate with your family. Here’s another comment of utter admiration for what can only be described as a momentous achievement! Massive congratulations Ed on an unbelievable journey with epic highs and lows I’m sure! As your book closes on an awesome adventure I myself have just completed my final exam and ultimately my second year at university. Will really look forward to meeting you when you get back and hearing about the stories you have to tell, sooner rather than later one hopes. It’s been great reading the encouragement you have received along the way, and although the relationship that exists between us is little more than skin deep I had a tremendous sense of pride and awe as you finished your cycle. I have an idea myself if you have any time free over the summer, which perhaps will interest you, and don’t worry no bikes involved! This is amazing.I can’t believe it.Come home soon. I have enjoyed reading your blog.I look forword to hearing about it. Ed. Many congratulations on your triumph. It’s been a stunning effort over a journey that will, I suspect, shape your life. Enjoy the success and I’ll see you later in the summer. Scott.